Want to get the good enchantments of those rubbish gold items? Or did you get perfect enchantments on your sword, but the Knockback is bothering you? 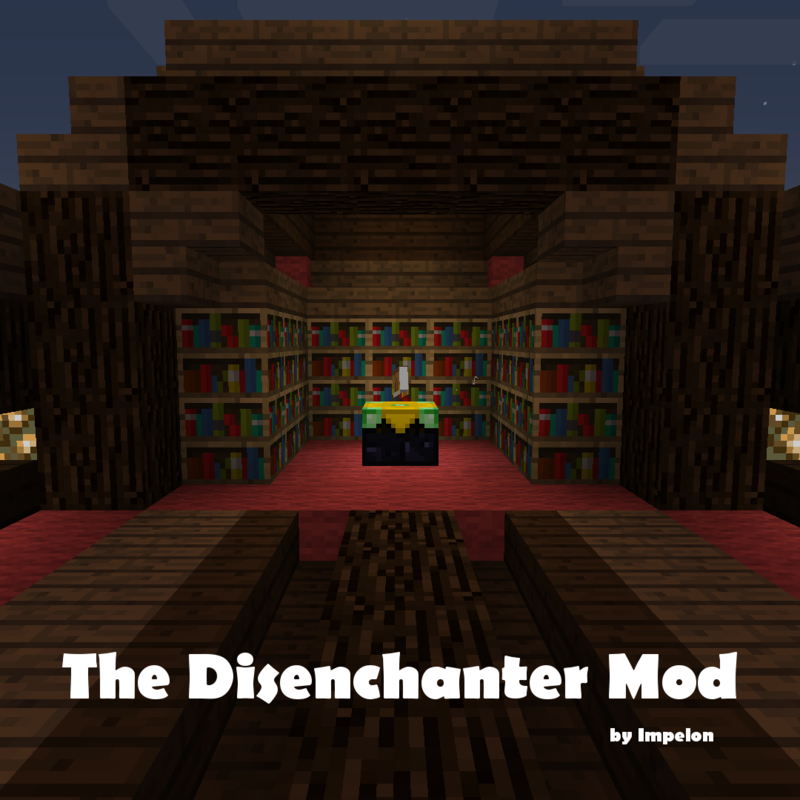 The DisenchanterMod is the thing for you! Also check out my other Projects! I am aware that this is not a new concept by any means. I just could not find a small lightweight mod (that is not outdated) that fit my needs, so I made this and figured that there might be others that would enjoy this small Mod. Also this uses a BSD License, which means you can use it for your modpack. The texture on these looks very similar to the Chunk Loader from ChickenChunks. It'd be nice if it weren't yellow. Functionally a great mod though. Well I do not know if changing the color would be so great, given that I included yellow dye in the crafting recipe. I would not like to change the recipe, keeping the continuity. Keep in mind you can change the texture with a resource-pack. You'd find the resources you need to change here. You can find great guides on setting up resource-packs, you could look at the wiki's one for example, although you do not need to go into great detail. You just need a blank resource-pack and add your customized resources in the right location (aka. the same path as in github with ./assets/ as the root-folder). I wish I had the time. Unfortunately I don't right now. Thanks for the response though. And taint my modpack with the grid power system? No thanks. I have such a love hate relationship with Extra Utilities 2. I loved the original one though. I said FTB Utilities (which has chunk-loading that doesn’t any items, blocks, or energy), not Extra Utilities 2, but I understand why you read it wrong, as the text was so small. Besides, the grid power system in Extra Utilities 2 is fine. All you need is a few water mills and some water next to them, and you’re set for life. It’s super simple, easy, and cheap, so I don’t know why you’re complaining. To each their own, though. Oh okay. I honestly forgot about FTB utilities but I rememeber liking it. Thanks for the recommendation. And with regards to grid power, I don't like how it feels, like it's just an arbitrary requirement that doesn't really mean anything or have any context. Yeah, it’s a great mod! I'm not sure if it's beyond the scope of your project or not, but given the inclusion of Botania in one of my modpacks, it rather negates the durability cost applied by the Disenchanter. I was considering a modified version that required, say... Thaumcraft essentia, or Astral Sorcery liquid starlight, or Botania mana. If I were to program this, would you be interested in a PR? If not, would you be willing to sign off on a "fork" of sorts (it would only be the base disenchanter, none of its upgrades) so that I could include such a thing in my pack? I understand that the BSD 2-clause license allows me to do this without consulting you, but at the very least common courtesy obligates me to ask. Be you unwilling, I'm happy to continue looking elsewhere for options and would abide by your decision. Oh, I'm very sorry to have missed this. Must have overlooked my emails. Yes, I'm open to any new additions or any copies; as you've stated yourself I chose the BSD-2-license for a reason ^^ You are free to do anything with my work here! Hello, and thank you for the great mod. May I submit a suggestion - the ability to cycle through multiple enchantments on items to remove unwanted ones? Hm, I think I thought about implementing that and also did implement it for a local test version... For some reason I scrapped that idea though. Would it be difficult to implement in a future version? Maybe a config option, if possible? No worries, mate. Appreciate the mod as it is, thanks again. This seems very interesting, very useful, especially with armored mobs. Hello there, very nice convenient mod. I'd like to report one tiny problem I've encountered in the 1.12 version of the mod. It may be on my end but I wanted to post this here to see if anyone else has encountered it. You see, when I attempt to use the disenchanting table, I get an enchanted book with nothing on it in return. I've tried enchanting an item on the spot and then disenchanting it and still only received an empty book. Hm, that seems strange, that never happened to me... Maybe provide some screenshots or something? I don't know. It seems to me that this was an universal issue, it would have reached me earlier, since the 1.12 version has over 20k Downloads. I decided to reinstalled the mod and it no longer gave me the issue, must of been something that went wrong when downloading it on my end or something. Glad it works ^^ Have fun!